It's one of the best movies I've seen for a long time. Although at first, it seemed like the subject may be a bit too serious, it was one that is so real that it makes you think - and think hard. The heavy drama takes you through a journey to Africa and depicts the hard life simply by putting a set of lens in front of it. Unlike many movies of this kind, it did not seem exaggerated, but simply displays the harsh truth of the life there. The movie is raw, not atypical of a British movie. It makes you burnt with anger to see how people take advantage of the unfortunate nation and more so, how it is ignored or perhaps accepted all these years. At the same time, the love story behind it is so strong, it cuts your heart. 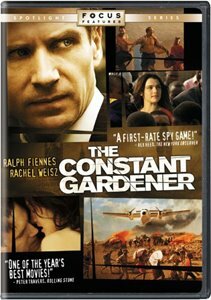 The acting was just superb - Rachel Weisz fully deserves the Oscar that she won for the movie, and Ralph Fiennes gave one of his most outstanding performances as the constant gardener. I highly recommend it for people who's in the mood to watch something that is worthy of your 2.5 hours of time - you won't regret it! This photo was taken in front of the Jama Masjid at Fatehpur Sikri during our last trip to India. 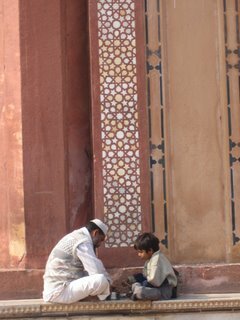 I caught a glance of this father and son sitting comfortably on a ledge of the beautiful 500-years mosque, enjoying a good lunch. 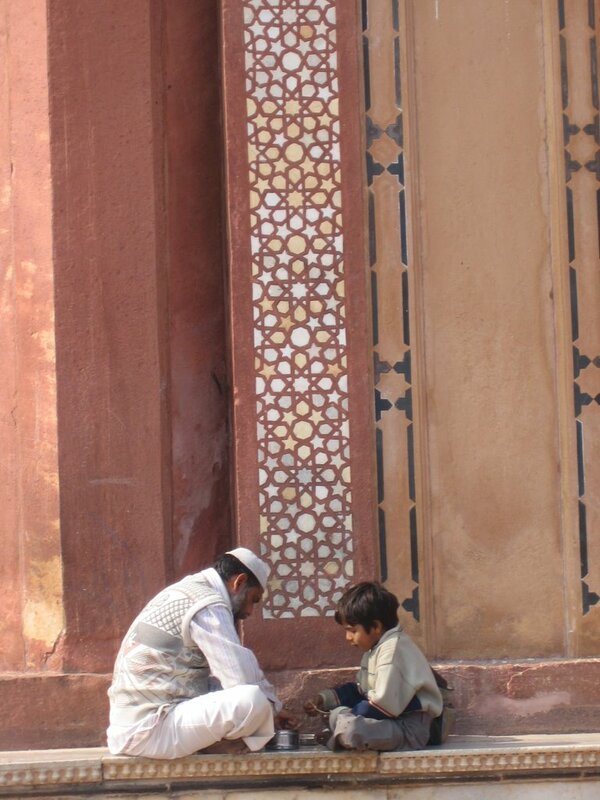 The father must be working in the mosque, and it is such a custom in India to have home-made lunches. The young children would bring these freshly cooked roti with dhal and some vegetables, packed neatly in a multiple layered metal 'tiffin' carrier to their father's workplaces. They would enjoy the meal together and spend some quality time with each other before the child brings the empty tiffin carrier home. One could just see and feel the closeness between them, and this is a very essential element in Indian culture, even today. I paused before the scene before reaching for my camera. Set against the grand historical mosque that is worn due to age and weather, but is undeniably charming because of it - it was a sight that touched my heart. I had a relaxing, nevertheless quite an accomplishing weekend. It started with a clearing the desk session, which consists of sorting-out of unread boring bank letters, bull-dozing of numerous god-knows-from-where-they-come-from pamphlets and useless receipts and keeping of all stationeries where they belong. 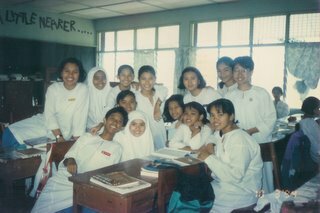 Then, right at the end of the desk, hidden in a corner, I stumbled on a paper-bag of old school photos, which I have been meaning to sort-out for months. I rummaged through them and soon found myself smiling thinking about the good-silly-old-days in boarding school. Right from Form One when we introduced ourselves to all the seniors through performing in the traditional Freshie Concert; to Form Two when we have just adjusted to college life of chatting away on someone's bed for hours on a Sunday afternoon; to Form Three when we rallied together to paint backdrops, made props and sewed costumes for the English Drama that brought us closer together; to Form Four when we were just so thrilled to at last be considered a 'senior' - thus could watch tv at the lounge, put our books and elbows on the dining table, organised the House Party and being able to lecture the juniors (i know it was a bit cruel, but you have to understand that at times we really ran out of ideas on what to do on weekends! ); and right through to being in Form Five when we were supposedly studying under the corridor lights after lights-off, but ended-up chit-chatting and gigling to the wee hours of the morning. The thing that touched me the most from going through the photos was how the simplest things used to make us happy - strolling at the courtyard (for fellow TKCians - by this I mean the Square) before dinner, the thrill of hiding with your friends in your pitch-black dorm to escape from a boring talk at the surau, the occasional KFC lunches, a weekly family visit, the pranks we play on juniors.. and teachers on April's Fool, the film-shows on the weekends, the list goes on. Although we were literally 'trapped' in the strict-ruled college from the outside world - the college grounds, its life, its people and its traditions became our own little world, and I think we loved it!